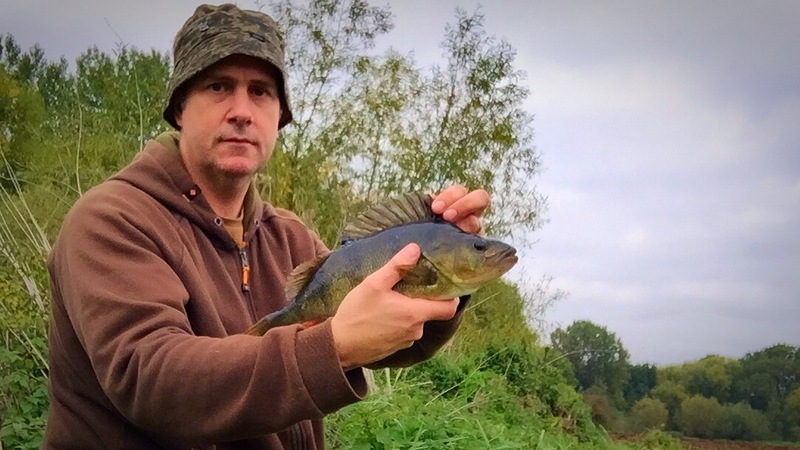 The exuberant smash and grabbers were here in a large shoal previously and after seeing the flanks of an extremely large perch showing itself when retrieving one of the live baits the near 2lber I eventually caught did nothing to quell the mystery. 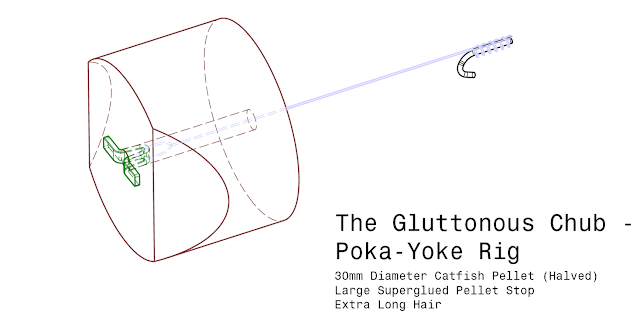 …but not under a 6g Pike float. 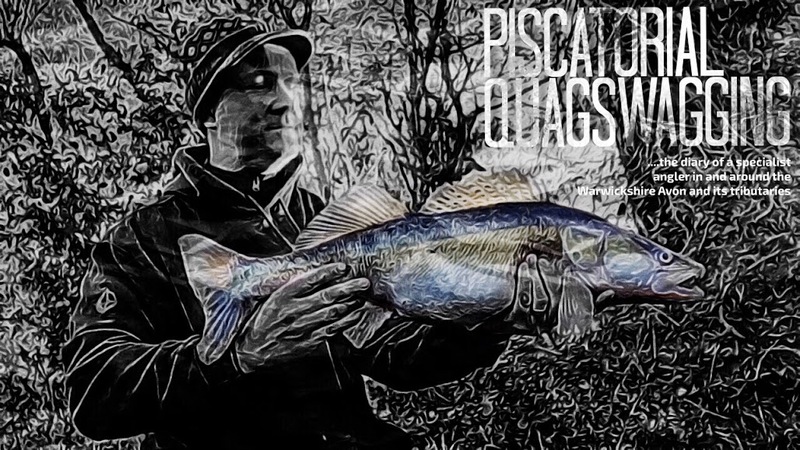 Having run out of time before I could find out what lurked within the swims depths, I came better prepared for this session as in addition to the dinky Pike float and size 6 Kamasan B693 set-up I made up a dedicated bleak catching rod and a bucket for holding the quarry. A size 18 barbless hook donned with a fake maggot, a self hooking weighty puddle chucker and maggot aplenty. Previously I’d changed hooklinks via a quick change bead, which was a pain in the proverbials, I wanted to maximise the preys’ exposure in front of a fat greedy perch as I could catch more bleak if need be whilst waiting the float to go under. This is one of the narrowest swims on the Avon I fish, with a long run up I’d say jumpable. It’s got stupidly thick far bank cover and despite the pace of the river due to the bottle-necking there is an unusually large area of slack that the float can be positioned. What the last session taught me was that the suspended and tethered Bleak will eventually move it off target and it will need to be re-positioned but often the prey fish will be cover bound and a few turns of the reel it’s back in the target zone again. The problem was I couldn’t fish as the light was fading so a bright sunny day with no cloud cover wasn’t ideal for perch fishing. Despite the recent rain, it was gin clear too which would probably mean the bigger wish would be tucked away. I thought causing a disturbance in the water with feeding bleak might get them interested. Catching the bleak was pretty easy, they seemed to prefer the faster water and trundling the float down a fish I had more or less a fish every chuck. I kept a small bucket of water for the baits which would be returned when the session was over. I suspect a net full could be easily achieved if that’s your thing. Half an hour passed without much interest but then the float sailed under and I struck in to a fish, damn a small jack Pike. I landed it under 5lb power pro and recast as well as feeding maggots in to the swim. Not long after the float sailed under but again, another Pike, this was hugging bottom and eventually it let go of the fish. The Perch didn’t seem to be interested so I changed to a 12lb soft braid and sure enough the float didn’t stay afloat for very long, straight under it went. A nice fight on light tackle but not a huge Pike, I didn’t weigh it but looked 6lb or so. With the swim knackered I tried a couple of swims upstream without interest so returned to the swim and eventually managed a small perch but then it went very quiet with no more fish caught. I’ll return again to try and capture the ace in the shoal but I’ll wait for more favorable conditions. It was overcast but not ideal Perch conditions, the Avon is still proper gin clear however I found myself with a three hour window of fishing opportunity and jumped at the chance. Just a decent Perch would nice. I know a swim where there are bleak in huge numbers so with a pint of maggots I decided to catch a few and keep them in the landing net and fish three swims for Perch. ...so after half an hour and biteless I moved back to the bleak swim and caught another 3 or so and decided to fish a bit of slack water by some cover. I could still see the bottom on most of the swim so not ideal but with a bleak positioned and slowed in its tracks it didn't take long for the float to sail under, maybe I was premature with the strike but I could clearly see the large flanks of a fish and it swam back to the depths. Another bleak went out and positioned in the slack and sure enough within 30 seconds or so the float was being dragged towards the thick cover. This time I gave it a tad more time and I struck in to a half decent fish. I could see it was a Perch and nice one at that. An oz bigger than a recent capture, at 1lb 13oz, it was a lean fish that felt hollow, still plenty of belly to fill it will definitely go to be well over 2 in a few weeks I would say. A quick post this but with the Wife away on a girly weekend I've some whippersnappers to entertain. Warwickshire Avon - Ham Bush !!!! and a PB. Maybe I was missing a trick...? I had intend to try and target some chubby dace in an area that has produced some good ones in the past but decided to fish these pastures new. When I arrived at the location there were only really two swims the first looked unfishable at it was thick with mud and I WOULD have ended up in the drink so the swim available to me was the only option. It was a wide long stretch and maybe heavy trotting would have been the better option but I could always fish it with another method if need be. When I took the meat out the tin I realised it wasn't as robust as Spam, in-fact it was very soft indeed, I had to be careful with the cast. It was extremely fatty too, not as garlicky as the proper stuff either. It looked great on the hair though, ideal. With both rods out I sat back and waited. For the first couple of hours there must have been a huge shoal of gudgeon because not only were there plenty of tip indications but every so often one of the greedy blighters would impale themselves on the hook. 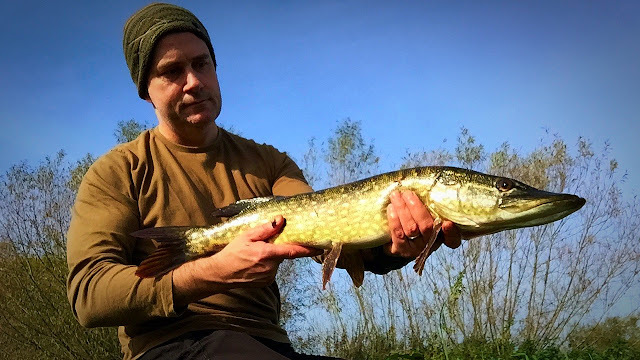 When a jack pike took one on the retrieve I thought about moving downstream but I decide to stick it out for the whole session.I'm glad I did too because some tell tale Chub pulls eventually I stuck in to a decent fish. It felt decent too and a spirited fight and a wrestle through some thick cabbages, I had it in the net. 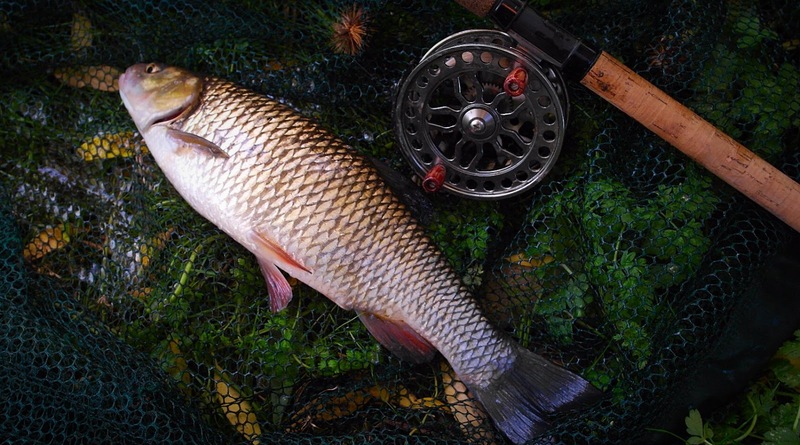 I use a Gardner Spoon landing net and I could see by its length that it would be a potential PB beater. (The centrepins spool measures 5") Now readers of my Blog know that I'm yet to catch a 5lb Chub so I was eager to get it on the scales. Bugger, not quite, 4lb 13oz and a PB...still not a magic five but encouraging signs especially when the Chub was fairly hollow and would go well over five I imagine when it's got it's head down feeding in the winter months. The monkeys not really to get off my back, just yet. 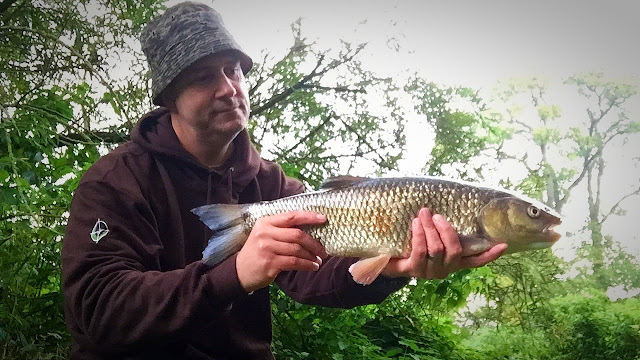 It powered off downstream and my finger drag on the spool was tested to the limit, I eventually turned the fish and felt much more in control of it after another couple of powerful lunges and a last gasp run when it saw the net I had a nice Barbel on the bank. It looked a double but on the scales it went 9lb 8oz, it made a nice change from photographing a Barbel in the dark, a lovely looking proud fish in mint condition. The rest of the session was uneventful and as soon as I got back home a few more tins of Pamapol meat went on the shopping list, it certainly did the trick today. Tackle companies must constantly rattle their R&D department’s cage to come up with the new wonder bait to get the angler to part with even more of their hard earned cash. I just happened to be in Stratford-Upon-Avon newest tackle shop recently (Timothy’s Bridge Road, reasonably priced and very friendly I might add) when I spotted some large tins of Dynamite’s Frenzied Hempseed & Snails. The snails came in two sizes, standard and specimen. Anyway according to the bumph …. It is widely understood that freshwater snails make up a large part of a fishes diet. Taking this into account we have developed a bait which harnesses all the natural oils found in our Frenzied hemp and infused freshwater snails as a carrier for the attractors. These snails make for a fantastic hookbait option and the 14mm 'Specimen' versions make an ideal hookbait for carp, chub, barbel and all manner of specimen fish.Using the same process that we use to cook the hemp in the tins, our Hemp and Snails are as fresh and natural as they can be with absolutely no preservatives added. Ok, ok, enough of that…. So as a now as an impecunious angler and £3.99 down (that’s a couple of bottles of Fox’s Nob) would this provide an edge every specialist angler needs ?, I’ve used ‘free’ foraged snails and slugs in the past and especially for Chub it’s produced when other baits wouldn’t, so would this canned ‘natural’ bait be any more of an attraction…? My fishing time is extremely limited and this was an impulsive and harefooted 2 hour session at a feature riddled stretch of the Avon. I put in a couple of droppers of hemp in a swim right behind an island which was more or less static. The river is up a nadger at the minute, in-fact it looked ideal Perch conditions. With the rod sat on the rest within a few minutes small fish must have been attacking the bait as the tip was tapping all over the shop. I got a proper pull round and struck in to thin air. Upon retrieving the bait the both snails were gone, bugger. I rebaited and the same thing happened 10 minutes later. For the third cast I added 3 snails but this time the bite resulted in a fish on. 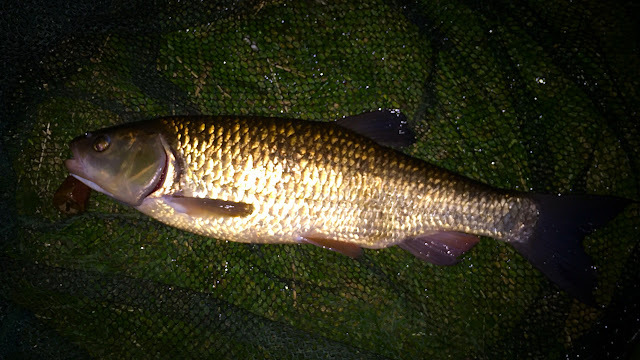 A nice scrap in the flow but only a smallish Chub of about 3 lb. With the light fading 3 more snails went on the hair but despite the knocks and tugs I left at my self imposed time limit (1 hour after dusk ) without another fish. I’ve enough hemp and snails for another session so I might give them another go when I get a chance. 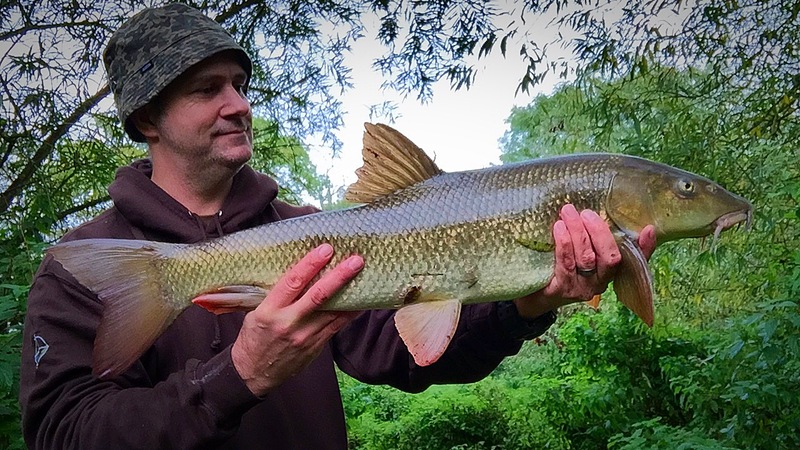 I might even visit one of my Barbel spots to see what they make of them. Saturday, 6.45am and the 5 Eastern European men with their cobbled together predator tackle are all drinking beer (if you can call it that). Two are occupying the peg I wanted to fish so after a brief word (pleasant I might add) , all but one with a rod licence, 3 with Warwick books I decided to up-sticks and move to an alternative venue.I had intended to try for a reputed Tench the stretch holds but I decided to drive a few miles away where I knew I would likely be the only angler. 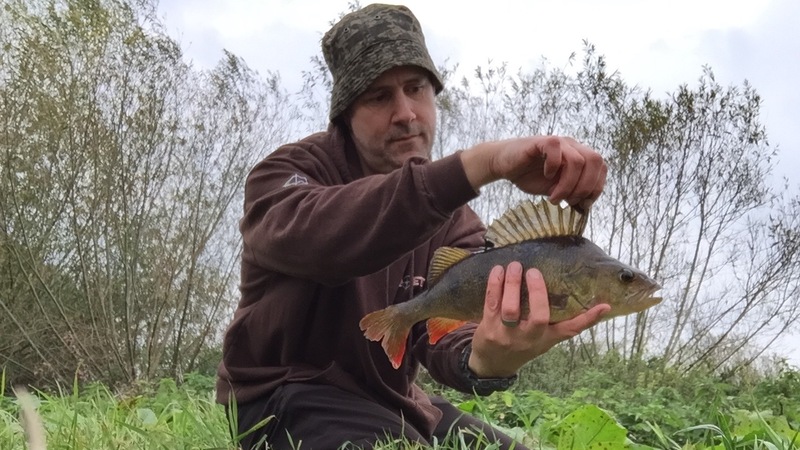 Perch wouldn’t usually be my target but there is a nice area of oxygenated foamy water where despite the difficult conditions the odd fish could be found, not only that but here is one particular swim that when it’s coloured there will be half decent Perch in residence. I decided to swing by home and also bring my light lure rod as I’ve had success in the past with a small shad. The Avon is proper gin clear and low, the clearest I’ve seen it in a long time, we really do need some rain as a bit of colour really does transform the fishing. I could see the bottom of the banker swim and as expected was devoid of fish, I cast in a lobworm for 10 minutes and not even a nibble…. …. so after performing a necessary worm massacre, the chopped chum concoction was deposited in the heart of the swim and left to rest for an hour or so and I moved downstream to the frothy spumescent swim. After half an hour or so with a firetiger shad without even a follow or a take I switched to a different colour and pattern all together, far less vibrant and within a few casts it was hit by something, a proper whack it was too. Initially I thought it was a small jack but then I caught a glimpse of the bright red fins, fantastic a Perch. Warwickshire Avon – I’m no Ronnie Pickering !!!! I’m with Mr Hatt on this one ‘just’ a Barbel won’t do these days, even a 10 pounder isn’t enough, I want to catch the huge one I’ve seen, an Avon record? possibly who knows, let’s just say it was a scale larger than the double figure fish I’d caught recently as I returned it to the swim I spotted the big'un, a fish that can give me tachyarrhythmia needs some attention. As per previous successful sessions I bait dropped a carpet of hemp and pellets and would leave it for half an hour and then from bat appearance to disappearance (an hour'ish) fish over the top with my Chub (Poka-Yoke) avoider rig It’s worked well so far and despite the flagrant and outrageously flamboyant bites that came from the pesky blighters the Chub have not managed to get past the no go gauge, the Barbel eventually did though and two half decent ones graced the net. Fishing for 12 hours, bugger that I have better things to do, this rig is about as selective as it gets. I said “excuse me” a few times and he didn’t even bother to acknowledge me, let alone engage in conversation. His brisk walking soon turned in to a full on sprint and despite his bright green jacket glowing like a beacon he quickly disappeared from view. He knew he was up to no good. ....so fishing in the dark doesn’t always sit well me well these days especially when he could have returned with his cronies and give me a good doing over, I was always looking over my shoulder during the remaining of that session but here luckily fishing a nadger in to the dark I find just about palatable. The light was fading now and the odd bat was making an appearance even though it was still easy to see. Eventually the canoeist returns and now thankfully I can now sit back an relax. Sure enough as soon as the isotope is glowing the bites start coming, they are coming thick and fast too, there are Chub in my swim. For half an hour the plucks, tugs and foot pulls never let up and the rig is doing it's magic, it should only be a matter of time now. I bought two rods for this session as the swim dictated it and on one of rods their was a chink in my armour, one of the hairs wasn't quite as long as I wanted ,so much so I even thought about retying it. The downstream rod whooped over in Barbel fashion and a fish was on, however I instantly knew it was a Chub, Arrhhhhhhhhhhh. One managed to get past the castle defenses, hopefully it's a one off as it's worked brilliantly up to now, anyway It weighed 4lb 4oz so not a bad Chub but not what I was after. I didn't bother to recast, so sat back and watched the remaining rod tip...10 mins went by, without even a knock, hmmmm strange, then upstream I heard a disturbance in the water and could make out a wake in the water, something was heading downstream I switched on my powerful torch and didn't want to see what I thought it would be. Yeap, a HUGE otter that stopped in his tracks and looked at me without a care in the world, he carried on about his business and dived in to my swim never to be seen again. I stayed for another half an hour and the rod remained motionless, Damn. Unless there is some rain to colour the water I'm giving the Barbel a miss for a while. 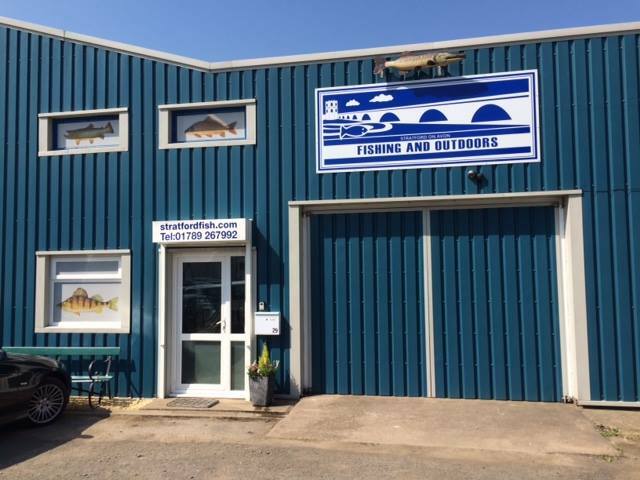 I've a cottage booked with a mate Simon in Symonds Yat the end of October and it just so happens has fishing at the end of the garden so my dusk fishing will have to wait for a while. Perch and Barbel on the agenda, any tips most welcome as I've never fished the Wye before.